Fiber Antics by Veronica: Whaddaya think, Teach' ? 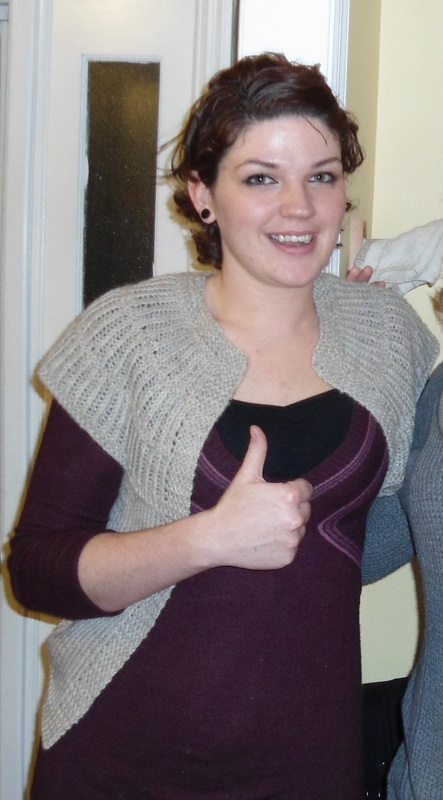 Shalom Cardi got a Thumbs Up! 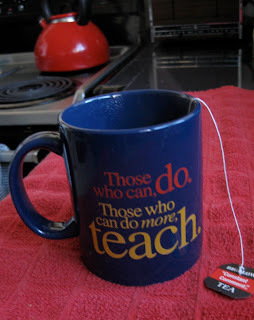 I love—LOVE—getting pics of projects that my students have completed. These are not class projects, but things they have seen or found in other resources (patterns, magazines, on-line), and have decided to make on their own. How exciting it is (and very gratifying for me) to see them venture out with the skills they have developed in class and create these pieces with amazing results! Since knitting this piece was so much fun, Lois made one for herself (right). 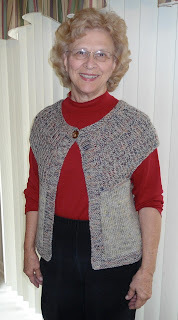 She added a button closure at the neckline and incorporated two different yarns—very attractive. I wore my version of the Shalom Cardigan to class a few times and Lois asked about the pattern. Sharon made this baby sweater and cap ensemble (below) for a friend's grandson. Sharon used the stranded colorwork technique and added Swiss darning for more embellishment. 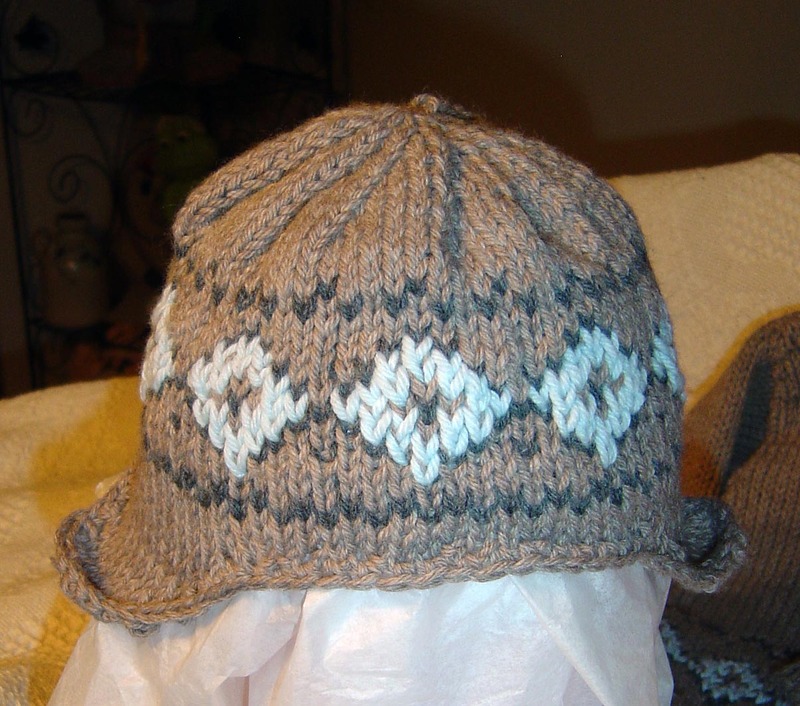 Details include a placket, buttons and button holes and don't you just think the ear flaps on the little cap are adorable?? This is one lucky little boy (and a lucky friend and mom, too) to receive this beautiful and thoughtful gift. 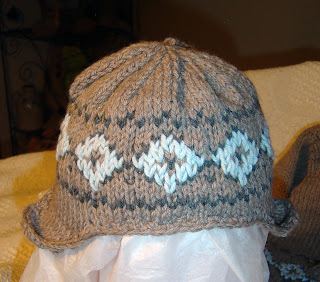 Stranded colorwork matching baby sweater and cap. 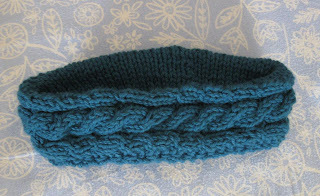 Here is a fun little one-ball quick-knit—a cable knit ear muff (headband). Pat made several of these ear muffs for Christmas gifts. A cabled band is knit and then stitches are picked up on one side so there is a double thickness of fabric. Soft, warm and a great stash buster. You could experiment with different cable patterns, background stitches (all purl or maybe a seed stitch?) and make one in every color. I would be remiss if I didn't include a nod to a fabulous, funny and inspiring teacher with whom I was fortunate to take a workshop this fall, Sally Melville. This project, the Cardilero (cool name, eh? 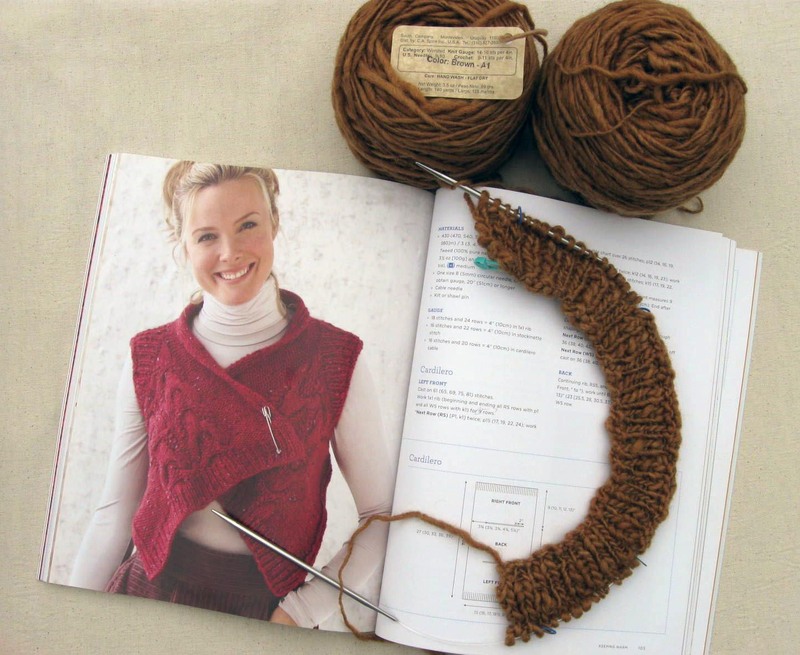 ), is from her book, Warm Knits, Cool Gifts. 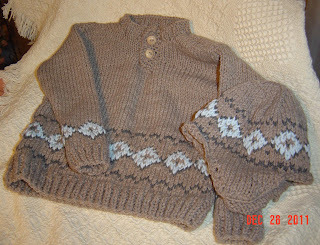 Cardilero pattern from Warm Knits, Cool Gifts by Sally Melville. I picked up the Rio de la Plata kettle dyed hand spun wool at the Knaughty Knitter and was inspired by Sally, her workshop and her designs. So, here is my Cardilero, with an extended left front and a shawl stick by Shaune Bazner. 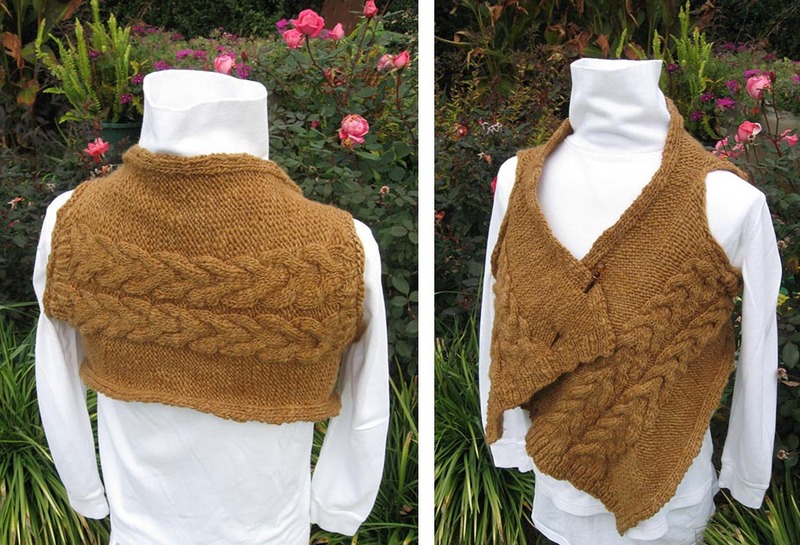 "Cardilero" pattern from Warm Knits, Cool Gifts by Sally Melville. Her famous Einstein Coat is in the "The Knitting Experience." I also like the cute vest Sally is wearing in the picture below. I'm sure it's one of hers. Anyone recognize the pattern? 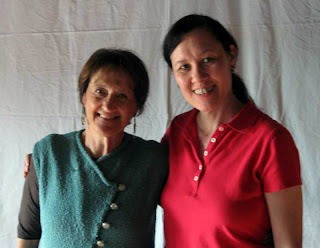 Sally Melville (left) and I at her workshop. 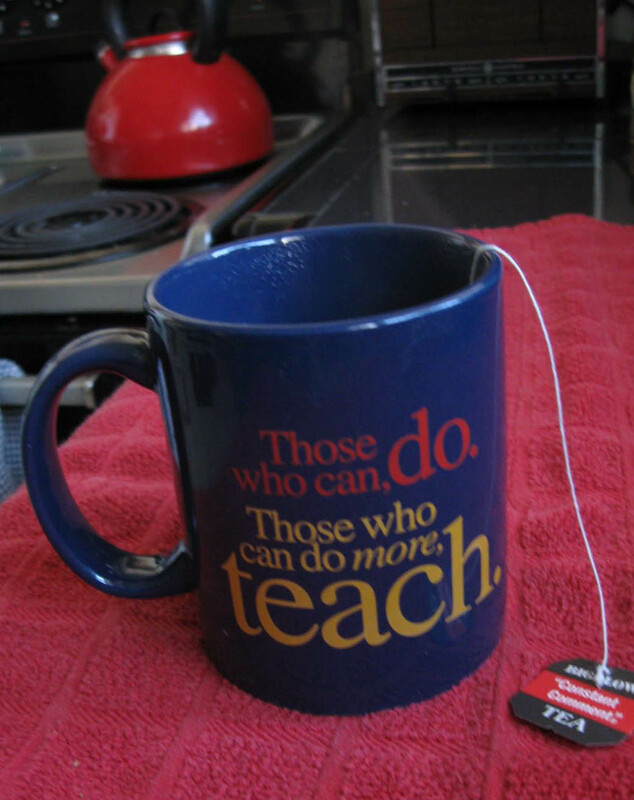 And, to teachers everywhere, Thank You for your inspiration, patience, encouragement and the creative inquisitive spark you ignite within us.